contact Dan Schaffer at (509) 624-2451 or traildan@comcast.net. 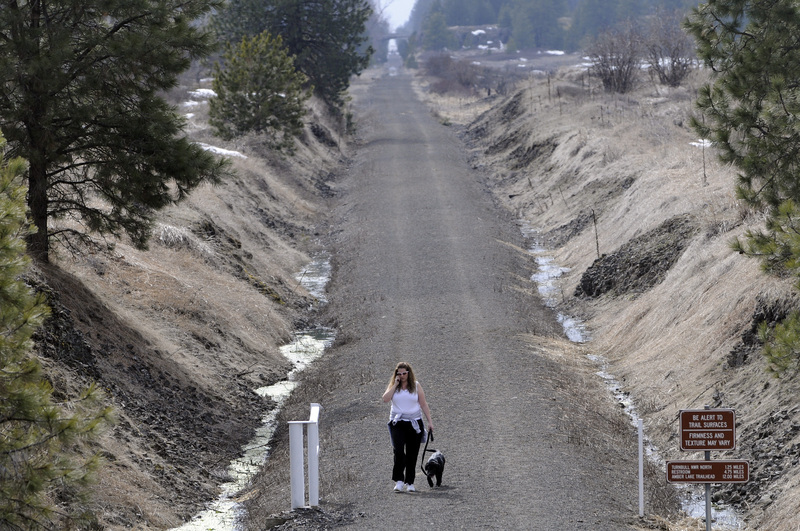 Construction on a paved rail-trail bicycle route between Spokane and Cheney must begin by June under stipulations for recently appropriated federal stimulus funding. 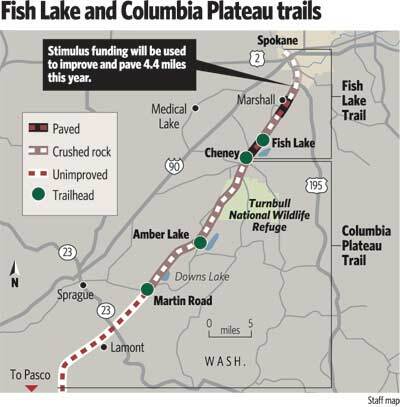 Plans for the second phase in developing the 10-mile Fish Lake Trail were ready to go when the American Recovery and Reinvestment Act money recently became available, Spokane officials say. The project fits government criteria for quickly producing jobs as well as providing for fuel-efficient travel and recreation. “The designers are getting the plans ready to get out to bid,” said Katherine Miller, the Public Works official who oversees Spokane’s transportation program. •Constructing a trailhead just off the Sunset Highway near the intersection with Government Way. •Rehabilitating four existing bridges for safety and passage. •Grading a route down and up at the crossing of Marshall Road. •Paving 4.4 miles of the route from Sunset Highway to a stretch of several miles that’s already paved near Marshall. Cheney has developed and paved more than three miles of the route from its city limits to Fish Lake and another stretch is paved near Marshall. Completion of Phase 2 will still leave a gap in the middle of the Fish Lake Trail near Marshall, Miller said. Even after Phase 2 is completed, possibly this fall, bicyclists continuing the entire length of the Fish Lake Trail from Spokane would still have to cross the railroad at Scribner Road to reach Cheney-Spokane Road. Then they would have to pedal nearly two miles on Cheney-Spokane Road before picking up the trail again to ride from Fish Lake to Cheney. From Cheney, the route continues as the Columbia Plateau Trail through Turnbull National Wildlife Refuge past Downs Lake to Martin Road. This 19-mile stretch has a crushed-rock surface that’s sweet to ride on a fat-tired bicycle. Most of the remaining trail from Martin Road west is a coarse rock surface until it reaches another developed stretch near Pasco. Miller said Spokane had to be ready to begin work on the trail within 120 days from March 3 under the stimulus program requirements. “Getting another 4.4 miles of safe, useable trail will help get support for private funding to finish the trail,” she said. Total cost for the Phase 2 project is about $2 million, she said. About $1 million had already been obtained through the state, subject to matching funds. The Spokane Regional Transportation Council Board recently launched the Phase 2 effort by awarding $778,317 to the project, or nearly 8 percent of the $10.4 million it received in federal stimulus funding it’s responsible for allocating to Spokane County government agencies.